I learned some cool functions that Google search field can perform to save users time and improve search results from Real Simple magazine. Hope you will find them helpful too! 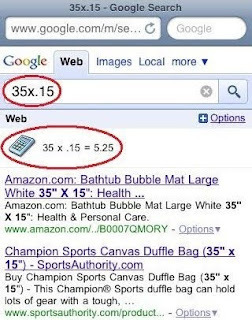 To figure out what's 15% of $35.00, just enter "35x.15" into the search field and click "Search". The answer will appear up at the top of the results page. Recipe measurements differ from country to country. How do I convert ounces of sugar to cups sugar? 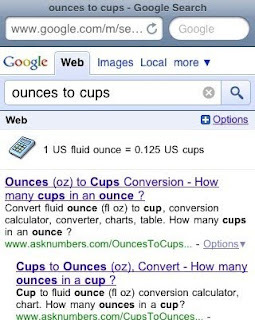 To figure out ounces to cups, simply enter "ounces to cups". Find out if your flight is on time by entering your airline and flight number. 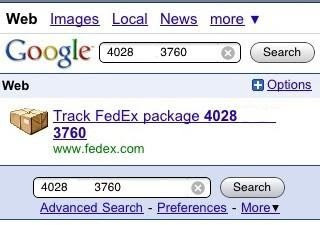 Type in a person's home phone number and, if the person is listed, Google will turn up the mailing address. Type "movies" plus your city or ZIP code to see theaters and showtimes. Include the file type in your search and Google will turn up only relevant files. Use filetype:pdf (PDFs), filetype:xls (Excel), or filetype:ppt (PowerPoint). For example to find a Nikon camera manual, enter "Nikon manual filetype:pdf" in the search field. Use a hyphen (minus sign). If you are looking for for lotus the car and not the flower, enter "lotus-car". Thank you. These tips are amazing! Whoa!! !That's real cool thanks for the tips. Btw if I want to know the big sweep numbers for the next lottery draw can do a Google search? hahaha..lol Have a nice day will do a google search very often from now. Those are all great. Thank you. Well, Google is getting better each time. Thanks for the tips. It is very helpful. I didn't know about this. Thanks for sharing! Oh wow! Thanks for the useful tips! I think Google is cool. You can find answers to almost anything using Google. I am really amaze at Google's ability. Thanks for sharing these useful tips with us. Cheers! I'm glad the Google tips I posted are helpful. When I read about them, I was surprised that we could perform shortcuts like that in the search field.